FILE - Taliban fighters are seen in an undisclosed location in Afghanistan, July 14, 2009. The United States has confirmed it is asking Pakistan for help in facilitating the Afghan government's direct peace talks with the Taliban insurgency. After months of strained relations and disruption in high-level mutual contacts, U.S. Vice President Mike Pence and Secretary of State Mike Pompeo this week spoke to Pakistani civilian and military leaders to push Afghan political reconciliation efforts. The flurry of high-level contacts came as Washington suspended all military assistance to Islamabad and both countries imposed travel restrictions on each other's diplomats. Lisa Curtis, a deputy assistant to U.S. President Donald Trump and senior director for South and Central Asia at the National Security Council, has explained the U.S. is pursuing "multiple lines of effort" to promote Afghan peace. At a seminar Thursday in Washington, she said an important component of the effort is to ensure that Pakistan plays "a constructive role" in it. FILE - Afghan security forces inspect the site of a Taliban-claimed deadly suicide attack in Kabul, Afghanistan, April 19, 2016. "We have asked for Pakistan's assistance in facilitating a peace process and we have sought to understand Pakistan's own core security concerns and ensure that its interests are taken into account in any peace process," Curtis said, while speaking at the U.S. Institute of Peace. "However, we have to be clear that Pakistan's interests are not served by a Taliban resurgence in Afghanistan," Curtis added. Pakistan says deteriorating security in Afghanistan has created "ungoverned spaces" which are serving as sanctuaries for terrorists linked to Islamic State and fugitives of the outlawed Pakistani Taliban, who are orchestrating cross-border attacks from there. Officials in Islamabad also have routinely accused rival India of supporting these "terrorists" to destabilize Pakistan, charges New Delhi and Afghan officials reject. Pakistani officials have long pushed for seeking a negotiated end to the Afghan conflict, saying neither side can win it on the battlefield. U.N. officials also have acknowledged the war is at a "mutually hurting stalemate" and call for urgently starting peace talks to end the suffering of Afghans. Curtis spoke hours after Afghan President Ashraf Ghani announced his security forces will unilaterally cease anti-Taliban offensives for a week, taking effect next Tuesday, in a bid to encourage insurgents to seek a peaceful resolution to the war. Afghan officials have said the cease-fire will also apply to the Haqqani Network, which allegedly maintains ties with Pakistan's spy agency. Curtis again alleged the Afghan Taliban, including the Haqqani Network, has enjoyed sanctuary in Pakistan throughout the past 16 years of conflict. "Pakistan has a fundamental responsibility to address the use of its territory by these malign actors. One can acknowledge Pakistan's complex security calculus without absolving it of its responsibility to do something of these malign actors," she said. A Pakistani military spokesman this past week denied his country was supporting Afghan insurgents, saying sustained security operations have eliminated all terrorist groups. Major-General Asif Ghafoor said that Islamabad was willing to use its receding leverage with the Taliban to encourage the group to hold peace talks with Kabul, saying peace in Pakistan is linked to a stable Afghanistan. 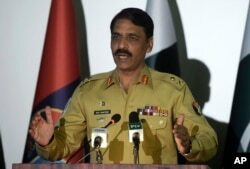 FILE - Pakistan's army spokesman Maj. Gen. Asif Ghafoor addresses a news conference in Rawalpindi, Pakistan, April 17, 2017. 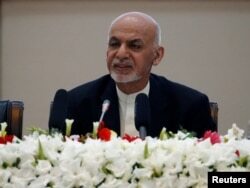 However, he emphasized that the Afghan government, together with the United States, will have to lead any peace initiative. Pakistan arranged a maiden round of dialogue between Afghan and Taliban negotiators in 2015. The insurgents have since expanded their influence to most of Afghanistan and currently control or contest nearly half of 407 Afghan districts. The Taliban has not responded to Thursday's cease-fire announcement by the Afghan president. The insurgent group has been seeking direct talks with the U.S. and refused to talk to the Afghan government until all U.S. and NATO forces leave the country. "The U.S. is ready to participate in the discussion, but we cannot serve as a substitute for the Afghan government and the Afghan people," Curtis said, apparently responding to the Taliban's calls for direct talks with the U.S.
Will New Deal for Pakistan's FATA Ease Terrorism Threat?